Looking to add some variety to your training treats? Try this easy recipe that uses fresh salmon and rice flour. Most dogs find them irresistible! 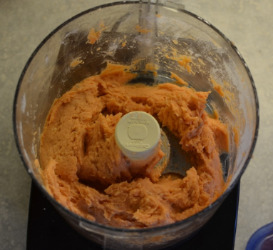 Puree the salmon and garlic in a blender or food processor with about 1/3 cup of water until smooth. If you're using a food processor, add the egg and blend. Then add enough of the rice flour to make a thick batter. If you're using a blender, transfer the salmon/garlic puree to a bowl, add the egg and mix. Then blend in enough of the rice flour to make a thick batter. Spread batter into an approximately 6x8 inch baking pan lined with release-coated foil (or greased & floured). Bake in a preheated oven at 350 degrees for approximately 20 minutes, or until the center is firm. Be careful not to overcook! Remove from pan when finished baking and allow to cool. Treats must be stored in the refrigerator, or frozen for later use. The key to getting a nice, firm, slightly rubbery consistency in the treats is the rice flour. Either brown or white rice flour may be used. 1 1/2 tsp. of garlic powder may be substituted for fresh garlic. Add 2 tbsp. of fresh, chopped parsley if you desire.